Versatile ventilation. 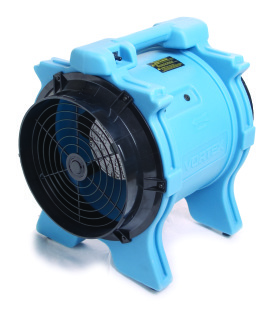 Use the Vortex to ventilate, create negative pressure, or add to a complete drying system. The Vortex can be set-up for operation by itself or with up to 125 feet of ducting – making it ideal for ventilation plus a range of drying applications including gyms, concrete pads and hallways. Powerful and handy. With its powerful 1.0 hp motor, the Vortex can effectively drive air through ducting or across large open areas. A built-in handle and simple 1-speed switch make operation a snap. 19.2 × 18.7 × 15.7 in.